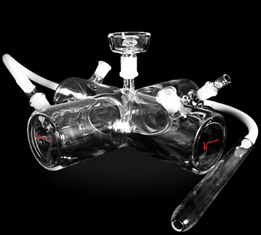 With a 4 hose hookah, your smoke sessions just became a lot more social! 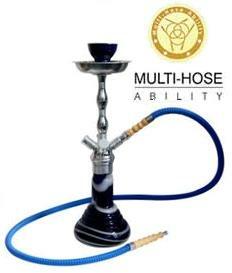 A 4 Hose Hookah features four separate hoses, effectively doubling the amount of people who can smoke from it. 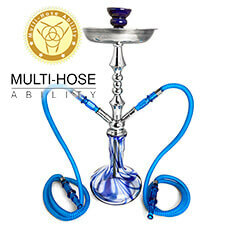 Four hookah hoses can support a large group of your friends, or four separate smokers who can enjoy their own hose. 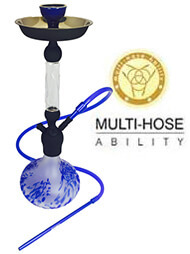 Using a convenient auto-seal system, a 4 hose hookah offers a smooth smoke for all four smokers, making your hookah sessions convenient, reliable, and fun. 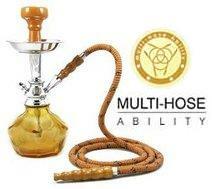 Check out the selection of 4 hose hookah products, now available at SouthSmoke.com! 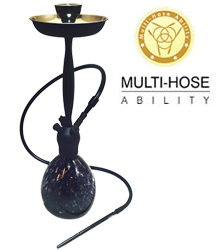 The four hose hookah was invented to meet the needs of the modern hookah lover. 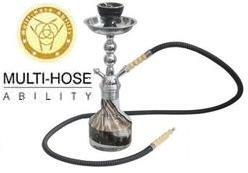 Traditionally, hookah was meant to be enjoyed with a single hose. 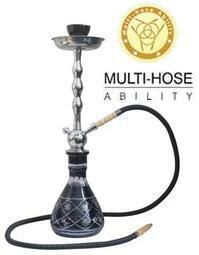 But in this day and age, where social gatherings are a major part of how we spend our free time, a four hose hookah is perfectly suited for our needs! 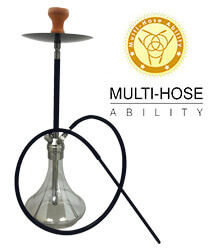 Multiple hoses allows you to invite over a much larger group of friends to enjoy hookah. There's no waiting involved with a four hose hookah! 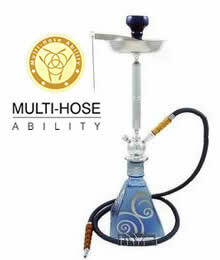 A four hose hookah avoids experiencing any downtime when waiting for the hose to get passed back to you. 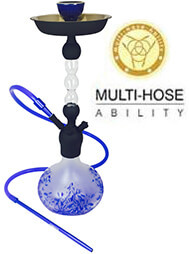 Although all four smokers can't smoke exactly at the same time, a four hose hookah is designed to provide a clear, smooth taste for everyone. You're used to paying for more-more features usually means shelling out more money. But with our hookahs, you can actually save a few bucks. 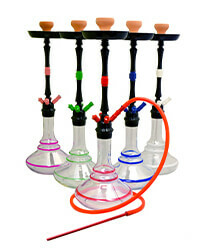 Many of our single, 2, or 3 hose hookahs easily convert into a hookah with four hoses. 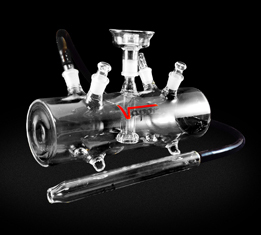 All you have to do is reconfigure the stem adapter that comes with most hookahs. It's a great way to save! Saving money sometimes means you have to skimp on quality. That's not the case with the hookahs at SouthSmoke.com-we select top brands to ensure you get a great purchase. 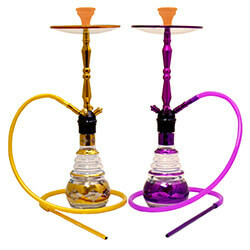 Vapor Hookahs and Mya Saray are two major brands that manufacture top-of-the-line four hose hookahs. 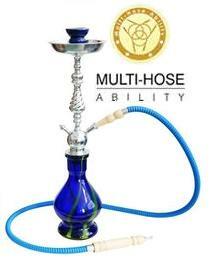 High quality glass and metal materials make up each hookah. Many feature never-before-seen designs that truly make your hookah purchase a unique work of art. Make your choice with SouthSmoke.com. 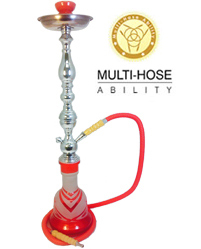 Whether you need a hookah with four hoses or a smaller configuration, you'll find what you need from our four hose selection. 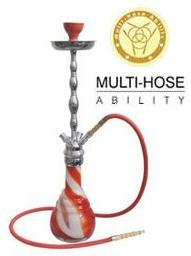 Contact us if you need assistance finding the perfect hookah for your needs.